Samples inert pressurized gases at their line pressures. This system outputs data to an external printer or computer. 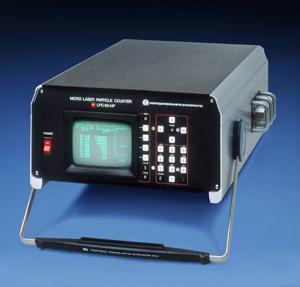 Laser Particle Counter: The Micro High Pressure Laser Particle Counter, Model Micro LPC 101-HP, samples inert pressurized gases at their line pressures instead of using conventional methods which vents the pressurized gas to ambient pressure. The Micro LPC 101-HP consists of a sampling sensor and a data system. Eight particle channels are available with a minimum sizing threshold level of 0.1µm for incoming line pressures of 40 to 150 psig at a sampling rate of 0.1 SCFM. The Micro LPC 101-HP utilizes a 5-inch CRT and an alphanumeric keyboard. Sampling and storage of up to 50 data samples can be programmed into the system.